New Yorker’s only get 5 solid months of warm weather so it’s no surprise that when the weather gets nice, we all go running to the closest outdoor space we can find. And I’m not different. I will literally sit on a garbage littered sidewalk if that means I get to dine “al fresco”. But while everyone gravitates to a garden, rooftop or a sidewalk, amazing indoor spaces are left almost abandoned during the summer. 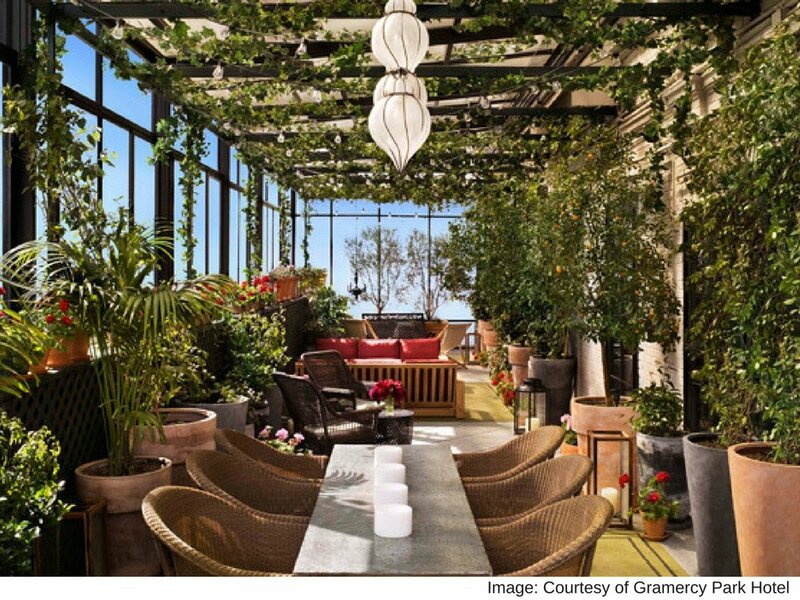 This blog is geared toward helping indoor spaces attract customers when the weather calls for a warm breeze and a sunset view. I can’t magically remove walls or give you a skylight, however I can tell you how to trick the 5 senses into thinking you have. 1. Smell – We start with the trickiest of the 5 senses. Not enough of this and you’ve wasted your time, while too much of it will turn people off. Keep it natural by incorporating fragrant fruits on your tables and in your overall décor. Mint, lemons and limes are guaranteed home runs for this purpose. Their smell evokes a feeling of freshness and cleanliness. Most importantly, don’t forget the fans (not the avid follower, but the blower of air). Give them a cool breeze with a ceiling fan and drive those summer scents into your guests’ subconscious. 2. Taste – This time of year is exciting for most caterers because they get to change it up with seasonal ingredients. Cucumber is largely in season which makes for a delicious… Cucumber Collins! (OMG, I can have one right now!) Of course, don’t forget the frozen drinks. For food, arugula, carrots and radishes are also at their best during warm weather which means your menu should be filled with yummy fresh salads with a twist – add strawberries, mandarins and pineapples to keep your greens from getting boring. 3. Touch – There’s nothing like a faux grass carpet to encourage guests to take off their shoes (same idea with a sandbox). Tree bark, Birchwood and Green-walls are a great way to add a decorative element you encourage your guests to feel. If you have sunlight peeking through a window, take advantage of it! The more unobstructed sunlight, the better! People love to feel the warm sun on their skin. 4. Hearing – Get your St Tropez or Ibiza soundtrack ready! What qualifies a song as a perfect summer hit? It engages the rest of your senses for you. Ever heard Will Smith’s “Summertime” and can smell the BBQ? Music even has time travel power because something about “I Need Your Love” by Calvin Harris ft. Ellie Goulding that brings me back to summer 2013. Summer playlists are always fun and must have “danceability”. 5. Sight – I saved the best for last. Your vision is the most powerful of all the senses. What you see can completely override the other senses. The solution is simple… Cute shirtless cabana guys & a fake pool brings all the girls (and guys) to the yard. Place a water feature in front of windows or right underneath a skylight so the sunlight reflected off the water can create twinkles of turquoise light throughout the room. And whatever you can’t actually have (i.e. the cabana boys and the pool), paintings or projections are a huge help. Are you warm yet? Ready for that summer cocktail? Don’t forget to give the well prepared indoor spaces a try!